The impact of FDA’s foreshortened inspection classification timelines, as prescribed by the second installment of the Generic Drug User Fee Act (GDUFA II), will include placing additional weight on the quality of the 15-day inspection responses, agency compliance officials are noting. The stress on the resources and expertise of the European notified bodies in taking on the assessment of the device component of higher-risk drug/device combination products is among the significant challenges the EU faces as it enters the implementation phase of its new medical device and in vitro diagnostic regulations (MDR/IVDR). 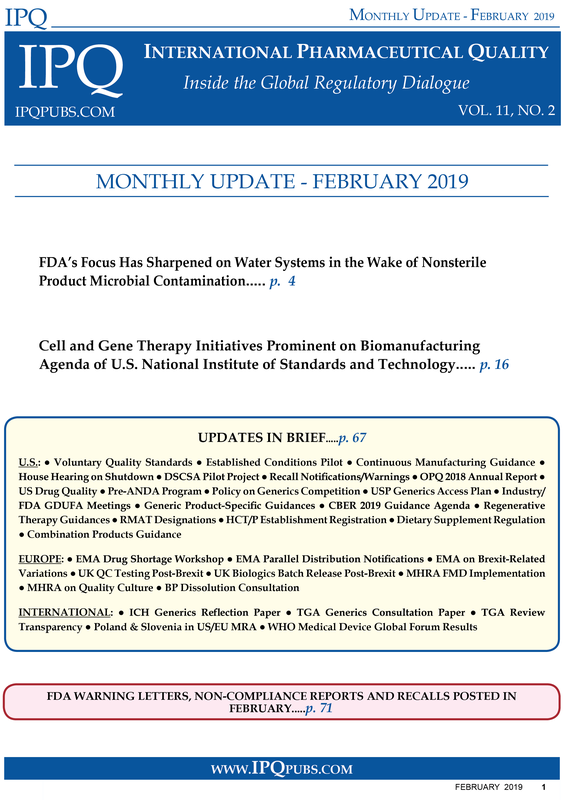 The three stories in this issue provide insights from industry and agency thought leaders on how the pharma imperatives of innovation, acceleration and regulatory harmonization are putting pressure on the existing regulatory processes and quality systems and what industry and agencies such as FDA are doing to try to evolve them. FDA has put in place an umbrella “Concept of Operations” (ConOps) intended to support the Office of Pharmaceutical Quality (OPQ) in its efforts to ensure consistency, efficiency, and transparency in facility evaluations, inspections, and regulatory decision-making for marketing applications and create a more cohesive review/inspection process. A transformation in quality systems is needed to liberate the power of information, digital, manufacturing and analytical technologies and accelerate the next generation of medical products reaching the patient, Johnson & Johnson Chief Quality Officer Francois Sallans affirmed in his keynote address at the opening of the ISPE/FDA/PQRI Quality Manufacturing Conference in June. Pfizer VP and Global CMC Head Roger Nosal is among prominent pharma thought leaders who are articulating the growing tension between the existing quality regulatory paradigm and the pharma imperatives of innovation, development/review acceleration, continuous improvement and regulatory harmonization. The issue opens with a review of the key priorities of the European Pharmacopeia and its ongoing initiatives to address them. Included are the pharmacopeia’s efforts in ICH Q3D implementation and in the biotherapeutics and co-processed excipient arenas. The second story focuses on MS-based multi-attribute methodology (MAM) and the increasing attention it is drawing in the industry/regulator dialogue. The attention reflects the potential MAM has already shown in biomolecule characterization, design and development, and the challenges involved in realizing its full potential in streamlining QC release and supporting advanced/continuous processing. The July 2017 publishing by the European Pharmacopoeia (Ph. Eur.) of revisions to its general chapter, method, and monograph sections is the latest development in the effort by the pharmacopeia to align its coverage of elemental impurities (EI) with the implementation of the International Conference on Harmonization (ICH) Q3D guideline. Biopharmaceutical manufacturers are seeking to expedite the process of taking multi-attribute methodology (MAM) from the development to the quality control (QC) arena and are working with analytics providers and government agencies to help address the challenges involved.